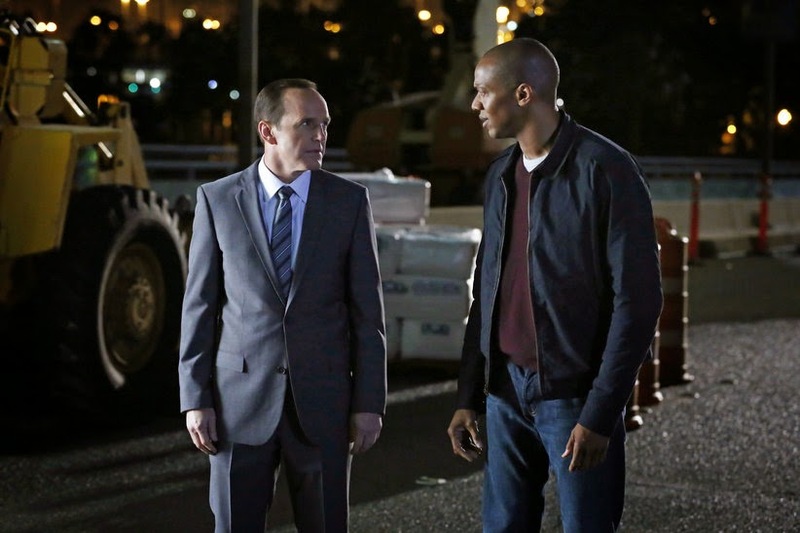 6 Impossible Things: Marvel's Agents of S.H.I.E.L.D. 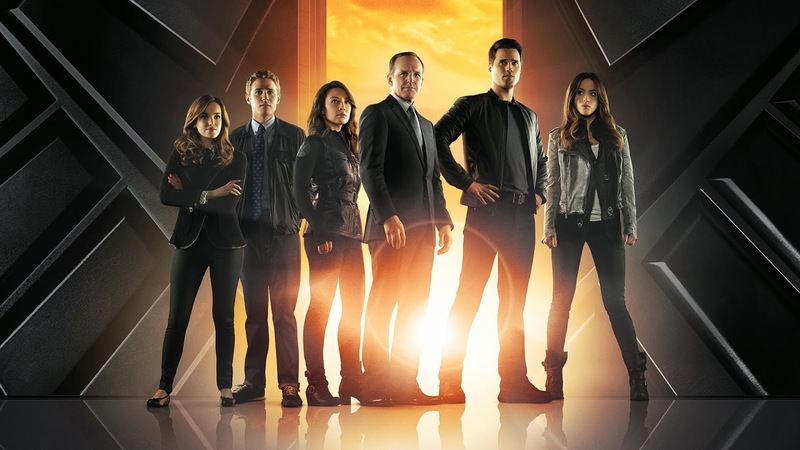 I really enjoyed Marvels Agents of S.H.I.E.L.D. (despite how hard it is to type the full name correctly) and I'd like to talk about why. Given its place within the MCU (Marvel Cinematic Universe) there are spoilers for this and other works, but I have taken care to separate these so that folk can read on a little spoiler-free. The programme started pretty lightweight and... not fluffy, because properly bad stuff went down, but perhaps somewhat frothy. It was soon clear that it was not all superheroes all the time, or even mostly superpowers. Agents of Shield was largely a light-hearted spy show, which threw in the tech, powers and alien-magic that existed, but was not explored, in the cinematic universe. I get that some people were expecting different things from content or tone and gave up early. It's unfortunate that the rocky start to it means people have missed out, but nowadays there are many options to catch up if you receive a good recommendation. I hope some of you will consider this that recommendation. After all events in Agents of Shield are tied to a wider universe, so the pacing has to work around the films. It's better reason for a slow start than other series have. The early episodes were mostly standalone and set up themes/arcs/mysteries for later. There was a thread running through several episodes, but it didn't always take centre stage. They also introduced the main characters, focusing on who they were and what they could do. The team were put into situations where their knowledge and skills could be used for what they were told was the greater good. Some main characters were more likeable/interesting than others, and there were usually guest characters who were similarly variable. The series started to join up with the films after Thor: the Dark World, although the connections were not strong there was a sense of being part of a bigger universe. Episode quality improved. There were more arc plots involving the main characters and certain of their back stories. Plus allies and enemies reoccurred, and we learned more about SHIELD as an organisation (it is what they are agents of after all). The peril grew, the stakes raised and mysteries deepened. There was a sense of greater things coming as the series built towards something, and I was intrigued. Then Captain America: The Winter Soldier happened and changed the game. 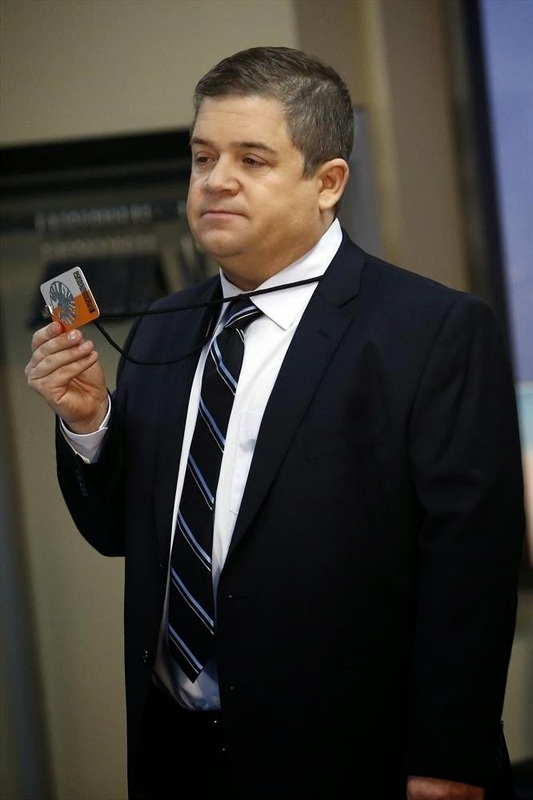 Episodes after that were amazing, full of suspense and intrigue and great character moments. The tone became darker and more serious, but still not gritty and with some great comedy moments in the mix. The characters I was less keen on became more interesting, and the ones I'd always liked became great. The new elements introduced were real game-changers and set the show on a whole new path that's only just started. I can't wait to see what series 2 brings. My favourite characters are Simmons, May and Coulson. I mostly like Fitz, though his attitude to Simmons towards the end of series seemed unnecessary. Skye is fine I suppose, but I rather suspect her backstory will prove to be more interesting than she is. It's not that there's anything wrong with her, but I think it could be that Skye is meant to be our gateway character and I don't feel as though I identify with her. I never liked Ward, and after Turn Turn Turn I felt pretty vindicated. Ward was never likeable or interesting, though I now wonder how much of that was because he was basically a facade all along. It's interesting to see how the various types of 'power' from the films are used here. It's balancing act that Avengers was a bit too busy to deal with. The fact that the mystery baddie was called the Clairvoyant, and no one knew if that was an accurate description of what they could do, tells you the kind of stuff this team are dealing with. The extremis tech/science from Iron Man 3 is misued as part of the Centipede project. Centipede initially looks like it'll be the big bad, but of course it's only a tiny part of what's going on. It's cool how many of the antagonists seemed separate but are linked in ways even they don't know (many heads of the Hydra), all building to the reveal we didn't know was coming. The Asgardians on Earth provide the magic and mythology (yes, yes, I know its supposed to be very advanced alien tech really, but it looks like magic and I say it's sufficiently advanced so therefore indistinguishable). They're more separate from the Hydra stuff, coming from another world as they do. 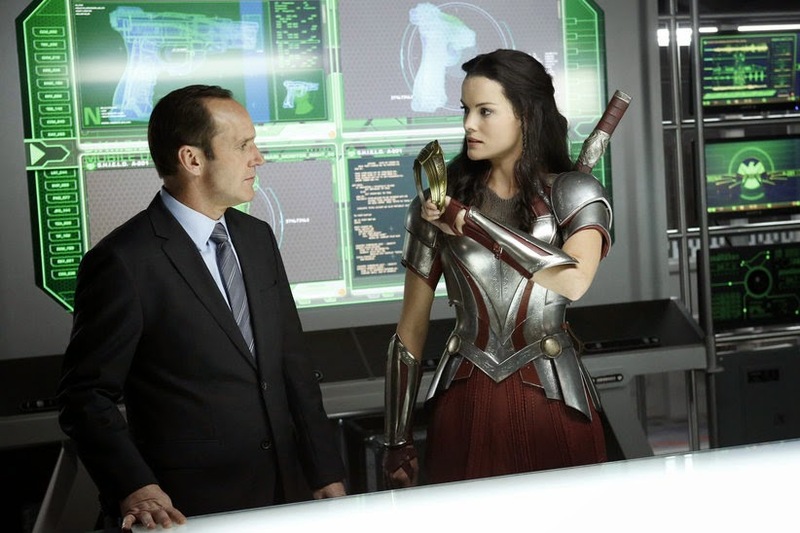 I really liked the episode when Sif showed up, she didn't get enough space in Thor 2. The antagonist's power over men could have been explored more (Does her power work on gay men? Lesbians? Is it to do with desire or a Y-chromosome? Why didn't they just send all the men far away?) and is a bit of a dodgy trope. I now realise that the episode may have been foreshadowing the danger Ward becomes later. Plus Sif mentions that she was sent by Odin to retrieve prisoners after the Asgardian jail break. Having seen the end of Thor 2 I really want to know about what "Odin" is doing. The episode where they break into the mysterious mountain to save Skye, and Coulson sees what saved him had me on the edge of my seat. The mystery of Coulson's return to life is a good one - though I don't understand why my DVD of Avengers Assemble took out the tip of the spear from Coulson's death scene, the show agrees that he was impaled. 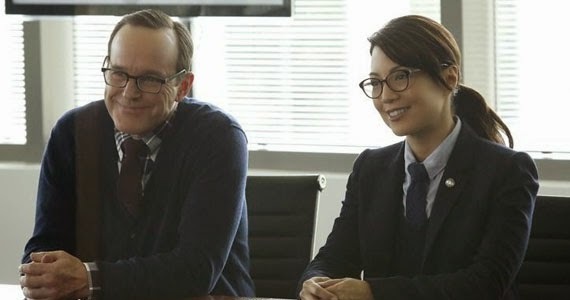 I also liked the episode in the SHIELD Academy (if Simmons is science-Hermione then the Academy is science-Hogwarts). It's the only institution in the MCU that could have a similar to feel the Xavier's School for Gifted Youngsters, which of course Marvel can't use on screen. I hope they made it through the rise of Hydra. Speaking of which, how good was Turn Turn Turn? I didn't know who was on which side for about half an hour (even with my husband telling me what alignment some characters had in the comics), and it was great. The introduction of Koenig was good, and his death saddening. The end of the series was excellent and I liked how there was comedy amongst the darker stuff. Simmons would want the TARDIS on a desert island, best answer ever! I love her. "This is just me being honest, Phil"
Those symbols Garrett drew after he went even more crazy, and that Phil started drawing too (in his sleep?) have appeared before. Ward sees them on a blackboard when he breaks into that facility in Eye Spy. Also something that looks a bit like them appears in Coulson's weird flashback. This is clearly being positioned as an ongoing myserty for next series, as is Skye's parentage. It's long been clear that Skye is some kind of dangerous McGuffin, or was treated as such as a baby, and I suspect she may not be fully human. What that makes her I have no idea. Still it'd be cool to have someone with powers on the team. Then there's the appearance of the Koenig twins? Clones? Doubles? I expect we'll find more about that fairly quickly.